Ananka's Diary: What's the Meaning of This? Many ancient societies believed that birds conveyed signs from the gods. 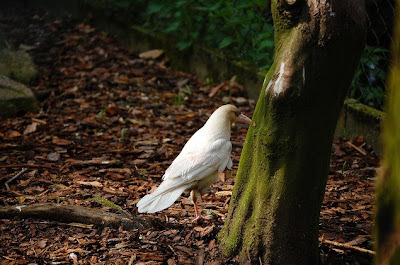 The appearance of certain kinds of birds was seen as a good omen. Others were clear indicators that disaster was on the way. What would the ancients have made of the rare albino crows that have recently been spotted soaring over Vancouver? Maybe they've come to bestow blessings on the city. Or maybe, just maybe, they're a sign of an especially horrible post below. omg . . .def. bad omens . . .and the feet thing so bluk . . .what a crazy person to do that they must want to be know as killers . . .what do you think??? I believe that the crows are probably a sign of the feet because in some cultures white means death count the crows, are there five? That looks like IRK (I think that is his name) from the book the crow! I'm back. I have a lot to catch up on so sorry if I talk about past blogs. -the article about the girl getting kicked off her sports team(May 27) Another girl at my school & I were asked to be on a boys sports team bcuz 2 of the boys dropped off. Halfway through the season we were kicked off bcuz parents complained we were playing too much. I said, "Those are CROWS?!" because I'd never seen an albino one before. I heard on the news that when the albino crows were found they were being encircled by many black crows above them. Apparently the black crows were very agressive and protective when citizens tried to take it's picture.